This is a complete kit featuring the SOF T Tourniquet and the Kydex ridged belt holder designed specifically for uniformed officers with limited carry capabilities. 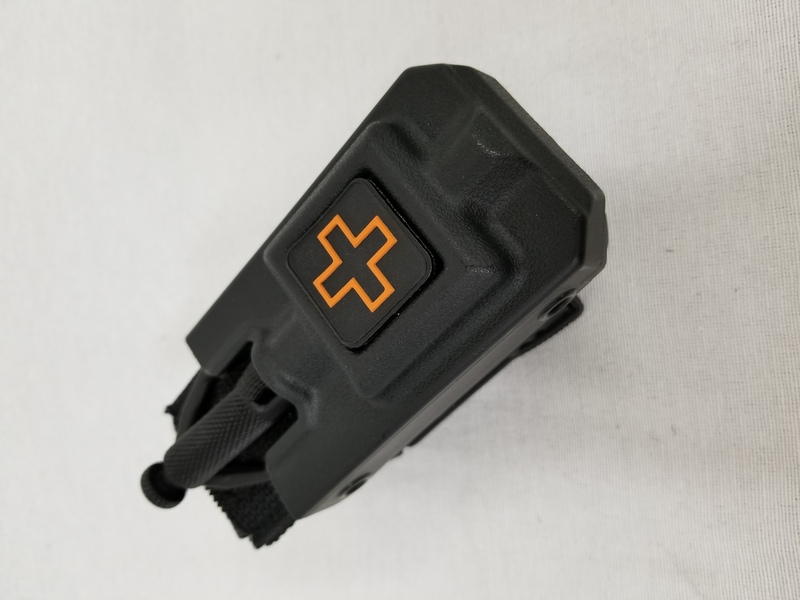 With this belt kit the officer can always have the TK at a ready position yet have it ridged enough to withstand foot pursuits, combative subjects and daily patrol functions without falling out of the holder. The versatility of this kit makes it also possible to be mounted to any MOLLE system. Mounts to any standard duty belt and can adjust to any under belt/instructors rigger belt. The SOF® Tactical Tourniquet (SOFT-T) is one of the top performing tourniquets currently available. It is the tourniquet of choice for many of the world's most elite and experienced warriors who have selected it for its outstanding ability to control severe bleeding, high level of reliability and ease of application. While some military units have replaced their issue tourniquets with the SOFT-T, others military units have implemented SOP's stating that the SOFT-T is to be used on all lower extremity bleeds. That means the SOFT-T is the tourniquet that trusted to control the most severe extremity hemorrhage on the battlefield. Simple application. The SOFT-T is applied the same to an arm or leg. Unlike other tourniquets that require you to learn two methods of application and implement the proper method when under stress, the SOFT-T is applied the same way to an arm or leg. By accounting for the factors of human performance in combat we have minimized the risk of failure. Applying a tourniquet should not be a multiple choice exam, it should be simple and straight forward. The SOFT-T provides the necessary effectiveness with an unmatched level of simplicity to increase the overall effectiveness of the device. Durability. The SOFT-T is constructed of quality, high strength materials. The tourniquet handle is machined from a solid piece of aircraft aluminum and maintains its strength in extreme temperatures. The tri-rings are molded Acetyl, a high impact plastic that will also maintain its strength in extreme operating conditions. Reliable. The SOF® Tactical Tourniquet is designed to reduce the chance of accidental release or mechanical failure. Unlike other materials including Velcro, the fastening system will perform when soiled, muddy, frozen, or wet.